IKEA pencils might seem harmless, but not if you are Joerg Sprave who runs The Slingshot Channel on Youtube and you weaponized them into skin-piercing slingshot ammo. You might wonder how anyone came up with this idea or even why anyone would want to do such a thing once they had thought of it, but that's what Joerg does. Sprave explains the weaponized IKEA pencils idea on his Patreon page saying he loves "all things that shoot or cut" and has an obsessive interest in all types of weapons generally. "But my true calling," notes the German, "is the design and construction of home made launchers." It's worth noting Sprave has the laugh of a total lunatic. Fair enough. And, as he notes on the Youtube video, several of his fans suggested he weaponize IKEA pencils. So he went ahead and did that, after all, IKEA pencils are available for free around the world. Each and every IKEA store has them and you can simply take one (or more). It's an unlimited ammo supply. Very clever Joerg. So after ordering some off eBay(?) Sprave makes a video showing everyone how you can turn them into ammo. First he demonstrates that, yes due to them being pointy they can penetrate through things. The perfect object to get weaponized. Sprave then has to find something to project them with. He starts simply by using a blow gun, which he fashions from the shaft of an aluminum arrow he happens to have lying around. Like you do. But this is The Slingshot Channel and that won't do as a final weapon. 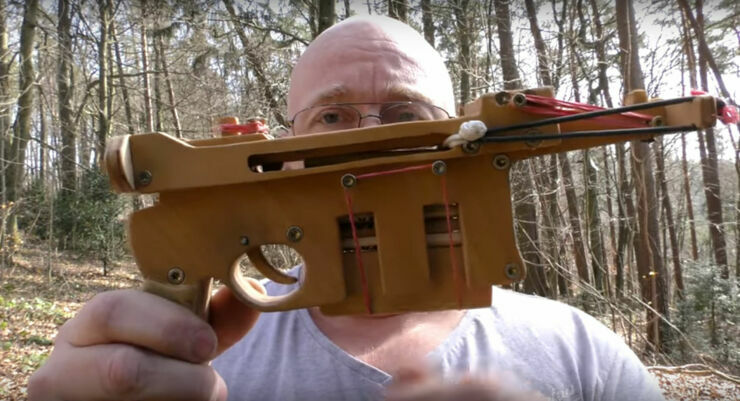 So instead Joerg Sprave creates a wooden replica version of the semi-automatic Mauser C96 pistol. It happens to be favorite gun of his and suits the weaponized IKEA pencils because it has stacked ammo, which will work well for the pencils when they're loaded up. The, admittedly impressive, weapon he ends up creating can take a maximum of ten rounds of weaponized pencils to shoot and fire them so hard that they can break skin. While all of this is happening Joerg laughs his unnerving laugh. It's both terrifying and hugely impressive all at once. This guy is one of a kind. For more of Sprave's crazy antics you definitely have to check out the video below. Which sees Joerg testing out various legal weapons, in Germany, that can penetrate through state-of-the-art badass police riot gear. All in the name of helping police to optimize their equipment, of course. Joerg Sprave is a living legend. Check out more of his crazy slingshot ideas (way more dangerous than IKEA pencils) over on Joerg's Youtube page.